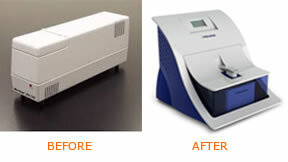 _The Nanotrac Wave is Microtrac’s latest generation of sub-micron Particle Size analyzers used in particle size measurement down to 0.8 nm for the manufacture of drugs, chemicals, pigments and other industrial compounds. The Wave project was initiated to replace a stale 15 year old product, modernizing and combining several models of analyzers into one modular, configurable system. The project was essential to improve customers’ choices & options, improve cost effectiveness and recapture market share. Machineart handled appearance design, part design for the plastic exterior and internal metal chassis, the making of an initial appearance prototype, and production documentation. Machineart worked with Microtrac’s engineers to help define the product architecture to enable easy process module updates and electronics exchange for re-configuration in the field. PCB cards install into racks at the rear while the process module is entirely exposed when the curved “hood” is lifted up at the front. A translucent blue cover reveals the module. The design of the wave form presents a “stage” to the operator for easily accessing the process module and its various tubular connections to ancillary equipment on the lab bench. The unique appearance makes a strong brand identity statement for Microtrac and clearly stands out in laboratories typically filled with with anonymous looking metal boxes.